Before re-publishing this post (originally found on tarotize.com) in August 2015, I added the image above to give you a better idea of what the cards are actually like and to be the ‘featured image.’ It is one of the luxuries you can afford when you go back over old posts… Why not, eh? Start of original post from 2012 —-> First of all, a thousand million apologies for the poor picture quality. The wonderful camera I have been using the past few months has gone AWOL and I’m back to using my little old digital camera which is very close to giving up the ghost. I won’t let you forget. who. you. truly. are. To say that I’m blown away by this deck is an understatement. I have cried more than once today, looking through the cards and trying a couple of the spreads in the companion book. 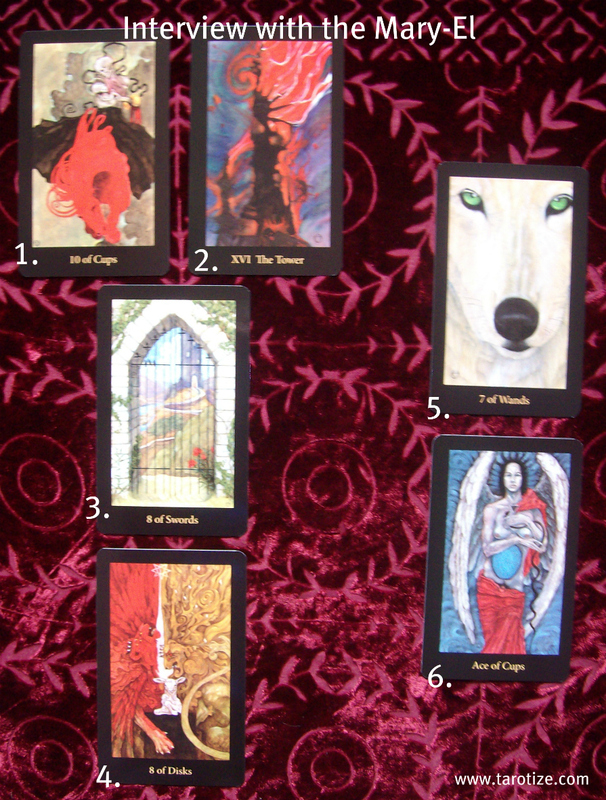 The Past Life reading I did with these cards was hugely helpful and relevant to a current situation. There is so much magick and power in the Mary-El that it warrants a life-time of study. It’s a deck to journey with and if you come to it with a heavy heart, you will be allowed to cry… You’ll feel seen and validated. I wouldn’t use this deck in readings for someone who is not looking for deep emotional transformation. And I’ll remember to bring a box of Kleenex! Some of you who read my interview with the Universal Fantasy (which arrived in the same Amazon delivery) will have noticed that the 8 of Swords is replicated in the exact same position in this reading. The Tarot is sending me a not so subtle message that it’s time for a new thought paradigm. Luckily, I have a couple of great decks to help with that!